Earlier today I went through the non-technical introduction to DICOM on the RSNA (Radiological Society of North America) website written by Steven C Horii, MD. As I was doing so I compiled a mind map using the excellent SimpleMind tool to help jog my memory on this stuff in the future. Click the image below for the full size PNG or it's also available here as a PDF. This is pretty cool. 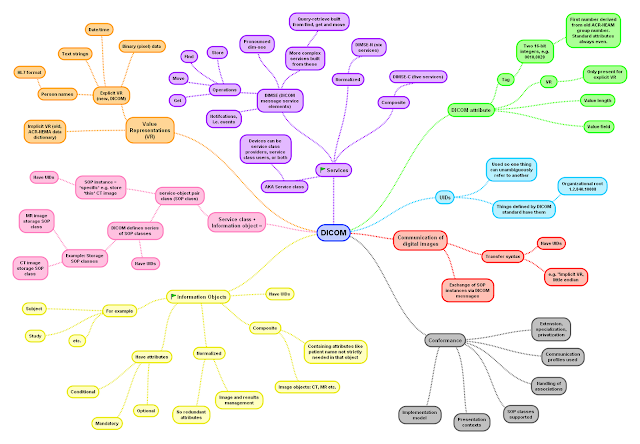 Recently, I tried mindmap to write test scenarios. That felt good. It definitely has potential. The only problem , I generally feel is- mindmaps allow only trees , and you can criss-cross nodes as in a graph . Which, I often find restrictive.